What do you wish you had saved for? This was one of the reasons why we have had “Goals” as an important feature in TrackEveryCoin right from the beginning. 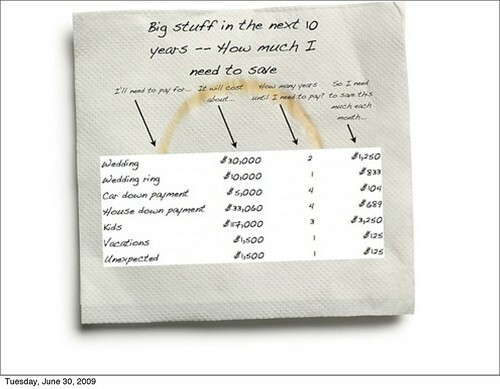 It is not only about saving money, but _why_ do you want to save money. At the same time, having real well-defined goals translates to motivation for you to actually save the money. When TrackEveryCoin is out, we will showcase how the goals feature we have in mind can help with your 10 year savings plan. __Update 1__ : Coincidentally, Sherin has written has a nice article today about the [5 financial life categories to think of when planning your financial goals](http://www.investinternals.com/2009/06/5-financial-life-categories.html): Assets, Liabilities, Personal Risk, planning on Kids future and education and finally plan for your Retirement. [Check it out at investinternals.com](http://www.investinternals.com/2009/06/5-financial-life-categories.html). __Update 2__: [Ramit’s blog post](http://www.iwillteachyoutoberich.com/blog/already-handled-basics-save-money-get-ahead/) on this topic is up! [Check out the amazing results](http://www.scribd.com/doc/16975724/Savings-Wishes-in-20s-30s-And-40s) of the survey.